Thibaut Courtois made his long-awaited Chelsea debut as Chelsea were soundly beaten by an impressive Werder Bremen side in our first pre-season defeat. In truth, the sight of Courtois and Drogba were the most positive points a Chelsea fan could take from today’s game as Chelsea were dealt with impressively by our German counterparts. The last time these two sides met was back in 2006, when the two met in the Champions League group stages. Bremen were victorious that day, winning 1-0. However, it’s fair to say that the Germans have suffered something of a slump since then, and as a result could only finish 12th in last seasons Bundesliga, making today’s result all the more surprising. It was a strong Chelsea side as the front six was identical to that against Vitesse Arnhem on Wednesday. That meant Fernando Torres occupied the wide left, Cesc Fabregas started in the no.10 role, and Diego Costa lead the line. Cesar Azpilicueta played right-back, while Kurt Zouma and John Terry were the centre-back pairing while Filipe Luis was at left back. Marco Van Ginkel and Nemanja Matic were anchoring the midfield and Mohamed Salah was wide on the right. Courtois’ first contribution in a Chelsea shirt was a hugely impressive one as a Werder corner was poorly dealt with and left ex-Blue Franco di Santo free from six yards but Courtois somehow denied the Argentine with a delightful save – one which undoubtedly would have Petr Cech shuffling in his seat as he grasps the enormity of the challenge he faces to keep the goalkeeping position he has made his own over the years. 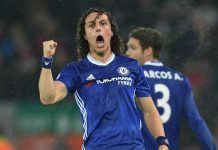 Two good chances came Chelsea’s way but sadly they fell to the wrong people – John Terry volleyed wide, while Kurt Zouma latched onto a Fabregas free-kick but couldn’t divert it past Raphael Wolf in the home sides net. Bremen were in front after a penalty was duly converted by Eljero Elia. The penalty was awarded after Terry was adjudged to have handled, and despite diving the right way, Elia’s penalty was superbly placed leaving debutant Courtois unable to reach it. 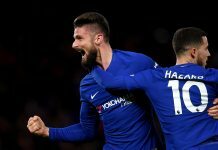 As they pushed forward for the leveller, Chelsea looked victim of something that had befell them several times last season against supposedly lesser teams – owning a lot of possession but finding themselves short of ideas and creativity to unlock stubborn defences. Not ideal to witness, as fans may expect a similar approach from Premier League newcomers Burnley in our opening game in nearly two week’s time. 17 minutes later and Bremen found themselves two in front, as another well taken goal, this time from Ludovic Obraniak, found its way past Courtois. Elia was again pivotal, as a wonderful ball into the area found the Polish international Obraniak, who flicked his header nicely past the Belgian stopper. Mohamed Salah had the ball in the Bremen net but was deemed to be offside, and thus ended the first half. Plenty of changes were made at the break in response to the deficit as five players, including keeper Cech, came on. There were first pre-season minutes for John Obi Mikel, and most thrillingly of all, a re-appearance of Didier Drogba in a Chelsea shirt, while Gary Cahill and Branislav Ivanovic completed the raft of changes made at the break. Drogba nearly made an immediate impact as he narrowly missed getting on the end of a Fabregas free-kick which had the home side confused all ends up. As is the case with most pre-season friendlies these days, the sheer number of changes made to ensure everyone had some game time meant that it was hard for the second half to flow and chances were limited. Nathan Ake, Eden Hazard, Lewis Baker and Jeremie Boga all made appearances throughout the second half as Mourinho sought to evaluate all his squad, with only two more pre-season games left before Premier League action restarts. Hazard had only been in training for three days but looked as sharp as ever, as he danced his way through the defence only to drag his shot wide. However, for all Chelsea’s pushing it was Werder who would go to score next and put the result beyond all doubt, as Nathan Ake was deemed to have fouled Felix Kroos, younger brother of World Cup winner Toni, with what in truth looked like a fine last-ditch challenge. However the referee was adamant a foul had occurred and with that Kroos stepped up and scored, meaning Chelsea suffered their first loss of pre-season. Our next game is away to Hungarian side Ferencvaros on the 10th August. Previous articleDidier to start German challenge?